It was a beautiful sunshiney day on Saturday. We loaded up the girls and set out to visit the farmers market. We stopped by the booth of Brian and Kelly of Black Sheep Farms, where we received Tom Thumb lettuce, some baby bok choy, and beautiful heirloom radishes. My goal is to turn their produce into wonderful tasting dishes. Does Black Sheep Farms sound familiar? They are a local CSA here in Omaha, you can read my post here. This weekend I prepared the baby bok choy two different ways –keeping it raw in a pesto, and softening it by grilling it. Which one do you think was successful? I saw the people over at Burp! Where Food Happens tossed baby bok choy and radishes with a little oil, and grilled it for a warm spring salad. They said the baby bok choy “grew suspiciously tender (and fabulously sweet).” I was intrigued and needed to try it immediately. 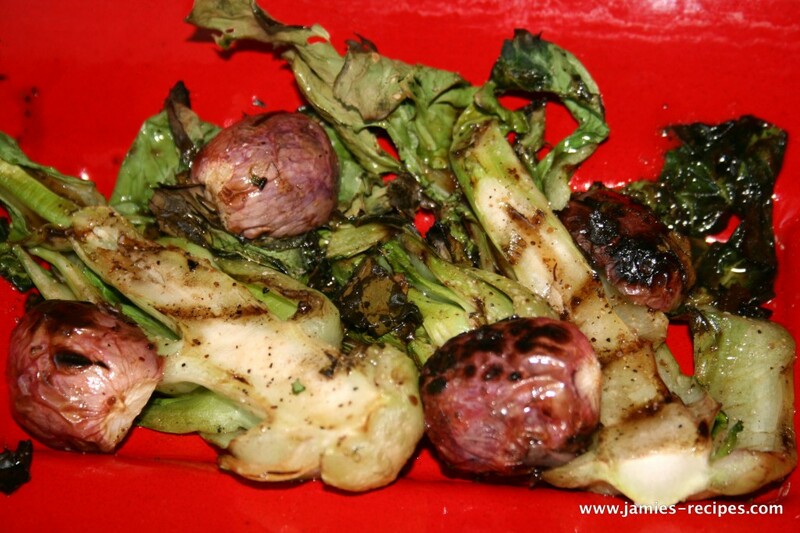 While the baby bok choy was grilling, I also tossed a few of the heirloom radishes on the grill. I’ve never heard of grilled radishes before, in fact I think the only way I have ever eaten radishes is raw –with plenty of salt. As I pulled my produce off the grill, I was growing more and more excited to try my grilled spring salad. Once inside I splashed a little Balsamic Vinaigrette over the veggies, sat down with my fork and knife in hand ready to enjoy my first grilled salad. Half of the baby bok choy was used in my grilled salad, the other half I wanted to use in a different way. Stir-frying it was out of the question, only because that seems to be a typical way bok choy is used, I was looking for an “outside of the box” way to use this veggie. As I was cleaning the baby bok choy for the grilled salad a few leaves feel off and I tried them raw. They were very green tasting and not bitter like I was expecting them to be. The first thing I thought was PESTO! If you do not know this already, I love pesto –and actually I have been known to eat basil pesto with a spoon. After a quick survey of my cupboards I noticed I had some cashews, and thought an Italy meets Asia pesto would make a great experiment. A while back I had made a meatloaf with an Asian twist, instead of meatloaf I formed them into burgers to grill and serve with my baby bok choy pesto. Two different recipes using baby bok choy as the main ingredient. One recipe I loved, and the other one I think I screwed up on. For me the baby bok choy pesto was the WINNER. The grilled spring salad wasn’t a complete failure. 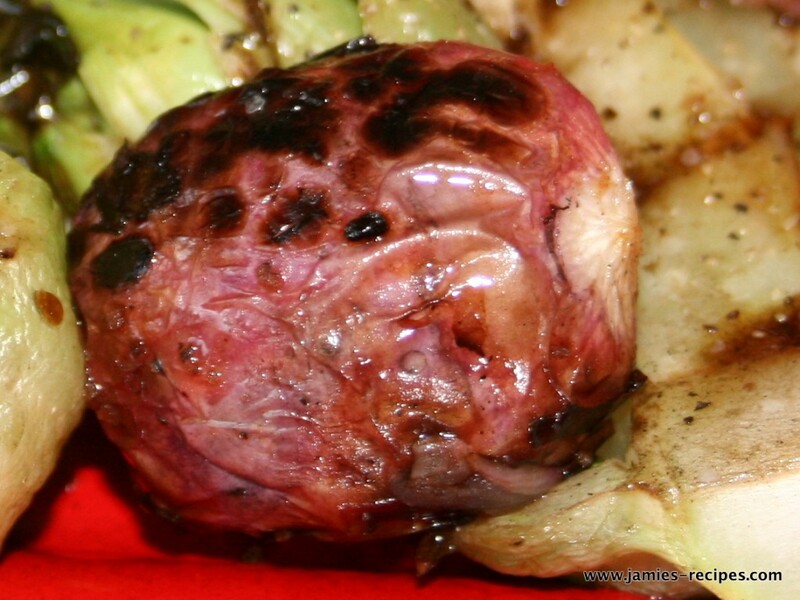 I learned that I really liked the warm tenderness of the grilled radishes, and hope that you try them that way. The first bite of the grilled baby bok choy was incredibly bitter. The baby bok choy isn’t entirely to blame, I think a lot of the bitterness came from the prepackaged Balsamic Vinaigrette I used. I should have tried the grilled bok choy BEFORE I doused it in the vinaigrette, I would also make my own vinaigrette instead of relying on a premade mixture purchased at Target. Lesson learned. Please don’t let my mistake stop you from trying this salad. Head over to Burp! Where Food Happens to get the recipe and read about how they call this salad “heavenly”. Add all ingredients through Parmesan cheese into blender or food processor. Pulse a few times to chop and combine ingredients. Slowly drizzle in olive oil until everything becomes one. Scrap down sides of container as needed. Add salt & pepper, and small splash of toasted sesame oil (this has a very strong flavor, so only a little is needed) and pulse until combined. Transfer to a serving dish, cover and refrigerate for at least 30 minutes for the flavors to combine. ENJOY! In a large bowl combine all ingredients and mix together, being careful not to over mix (you donât want your meat to get tough). Form into four patties. Grill over medium-high heat, for about 5 minutes each side. You want an internal temp of 180 degrees. 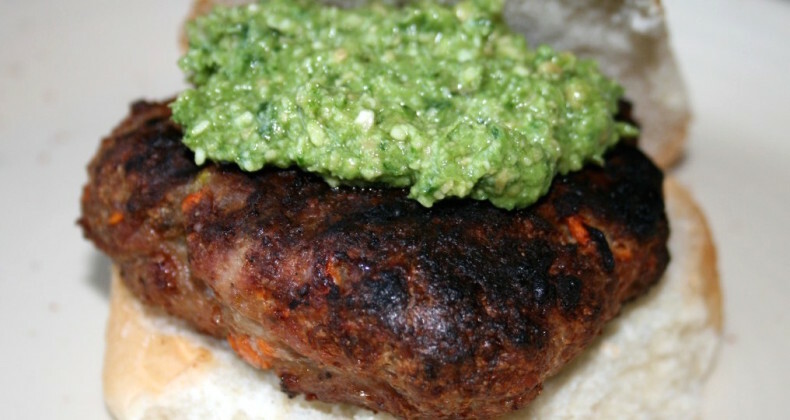 Place on bun and top with Bok Choy Pesto. ENJOY!! It all sounds very interesting. I have some new garden photos to upload to you. Potatoes are blooming as are some of the tomatoes. The beans seem to be a failure so we are going to have to replant. Mom- you will have to try grilling some of your radishes. They were really good. That burger looks pretty killer. The burger was delicious! The baby bok choy was a great condiment, but the burger can stand on its own. These look really delicious! I hope to try them out for dinner this week. Thank you for sharing the recipes! OK…I too like to try non-traditional cooking, especially of Asian foods…the baby bok choy in photo is Shanghai baby bok choy, I have used it as well as the other one that has greener tops..both great. The Shanghai is even more tender than the other..I have a bag full of them now and am trying to figure out what to do with them that is different..main difference for me is my husband is a strict vegetarian (I used to be)..so I have a good challenge everyday..and I like doing this. Tofu not Asian style etc. I love Asian foods too but like to try a difference. Pingback: Jamie’s Recipes | Two Years and Counting…. I found your site while searching for baby choy recipes. I have been getting them all winter long from my CSA and was pretty burned out on stir fry. Your bok choy pesto is genius! I had raw pecans in the cupboard so I used those in place of cashews. I’ve used your pesto a few ways including puff pastry pesto roll ups to take to a New Years Eve party and they were great. No one believed that it was bok choy. Thanks for a fantastic recipe. 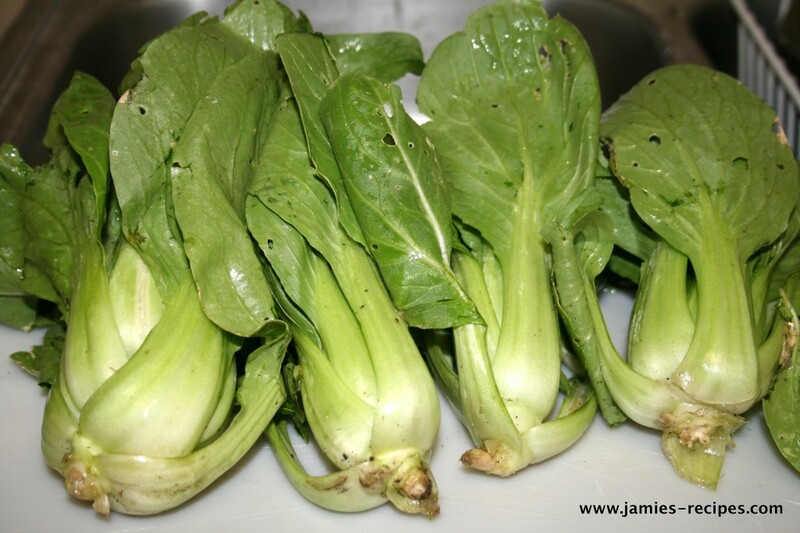 I just received another box today with a bunch of baby bok choy and I’m looking forward to making it again. I am so glad you liked the pesto. Your comment made me smile. I love the idea of the puff pastry roll ups. I’m on a very restricted diet and can’t have most herbs and an missing my pesto. But I can have bok choy so can’t wait to make this pesto!